Korea And The Silk Road. When I was growing up I learned about the Silk Road in a very simplified way, as it being one special route that brought silk and other goods from China to the West, and Western goods to China. Since then however, historians have come to realize that there were multiple trade routes, and that some are far older than they originally thought and traveled much further than they had previously known. Historians can map trade routes in Baltic Amber from Scandinavia to the Mediterranean dating back thousands of years. And the trade in tin from Northern Europe to the Mediterranean, and from China to the Middle East are almost as old. But these trade routes weren’t followed by a single trader, but rather each trader would travel a certain distance and pass the goods to the next trader at markets and in towns along the routes. This led not only to the passing on of tradable objects, but also information, knowledge and religion were passed from person to person along the trade route. Trading towns and cities grew up along the routes and trade grew. Unfortunately these routes also sometimes became the routes invading armies followed, and diseases could also spread from person to person along the different routes. This example of Roman glass excavated from a Silla tomb. China and Korea have had a long and intertwined history and trade routes between the two date back a very long time. In fact much of what we know about early Korea comes from Ancient Chinese texts. Among the many things they wrote they said that the people of Silla liked ‘glass beads and gold’. 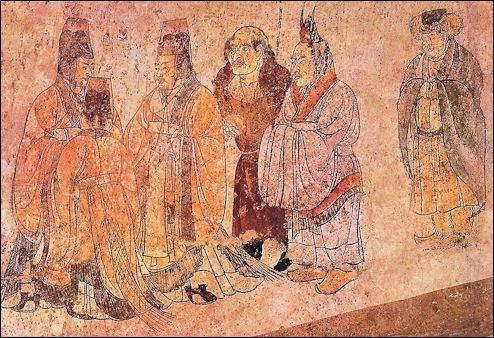 Much of the Three Kingdoms time period saw a flowering of art and knowledge and many people from Silla were known to have resided in China to learn, trade, and work. Many goods, artworks, and knowledge passed both ways between the two countries. Silla was said to have enjoyed ‘a golden age’. But the Three Kingdoms may not of just received trade goods from Chinese traders, they may also have been traveling some ways along the routes themselves, to perhaps obtain better deals and more diverse items. 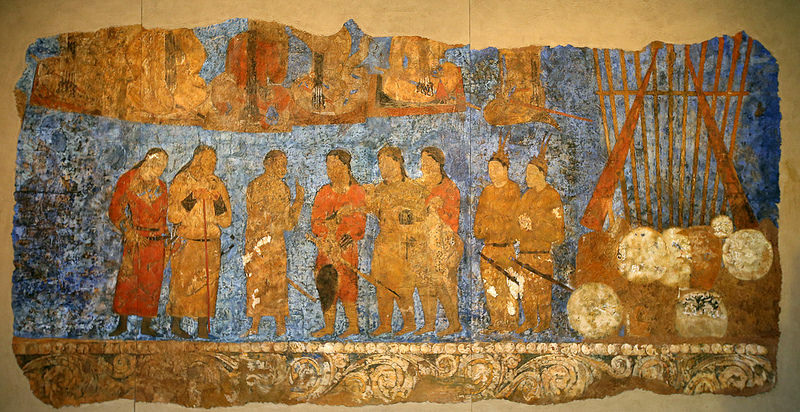 About half way along one of the more popular silk routes in Samarkand a Sogdian wall painting dating to 655 CE seems to show two men from the Goguryeo Kingdom in Korea, based on their clothes and weapons. The men in question are the two on the right and if they really are from Goguryeo this is amazing as they would be thousands of miles from home. 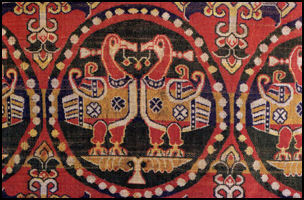 The above photo is of 8th century Sogdian Silk. The Sogdians were famed traders along the central parts of the overland silk routes and had many connections both east and west. If Koreans from any of the Three Kingdoms did indeed visit Samarkand it shows their understanding of the politics of the Silk Roads, and they were directly dealing with one of its most important players. There is a Chinese painting from around the same time period (7th cent. CE ) showing envoys from the Three Kingdoms at the Chinese Emperor’s Court so Koreans were very definitely traveling outside of the Korean Peninsula. The Three Kingdoms were also a through point, both by land and by sea, to Japan and were instrumental is passing along things such as Buddhism, the game of Weiqi, (called Baduk in Korea and Go in Japan) as well as Bonsai, (called Penzai in China and Bunjae in Korea) to Japan. In the Asuka period ( 538-710 CE ) the Japanese city of Nara could perhaps be considered the last stop eastwards on the Silk Roads. The Shoso-in Repository holds many Silk Roads artifacts from many far away countries. 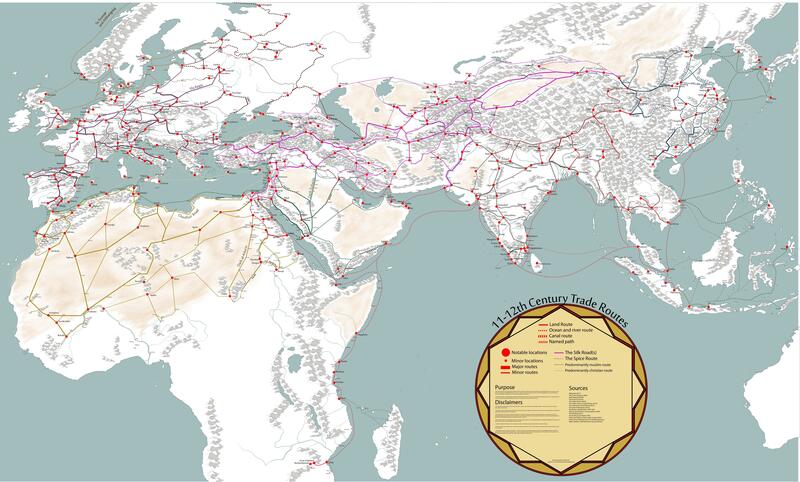 Merchants and traders weren’t the only ones to use the Silk Roads. Monks, Buddhist ones in particular, traveled far and wide, both to learn and to teach. Buddhist monk Hyech’o (approx 704-787 CE) from Silla followed in the footsteps of earlier monks and traveled to India and surrounding lands. He traveled by both land and sea and spent over 5 years doing so. He visited as far west as ‘the Arab lands’ and thankfully for us wrote a diary of his journey. In it he notes information on all sorts of different things he saw during his travels. Travel changes people and when they write about their travels those writings can influence other people too, leading to cultural exchanges of ideas as well as goods. 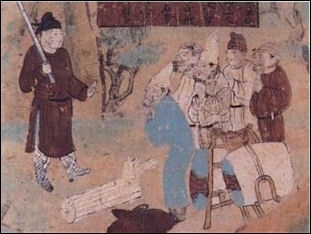 Hyech’o was not the only Korean monk to travel long distances, although he was one of the more famous ones. Many Korean monks and nuns traveled to Japan and help spread Buddhisms and later Confucianism among both the elite and working classes. They brought with them no only religious ideas but, along with merchants and refugees, they also spread the knowledge of silk making, as well as iron working techniques and the idea of surnames. Many other items both of Chinese and Korean origin were exported to Japan such as the oven, bronze bells, gold and silver jewelry as well as stoneware and household items. 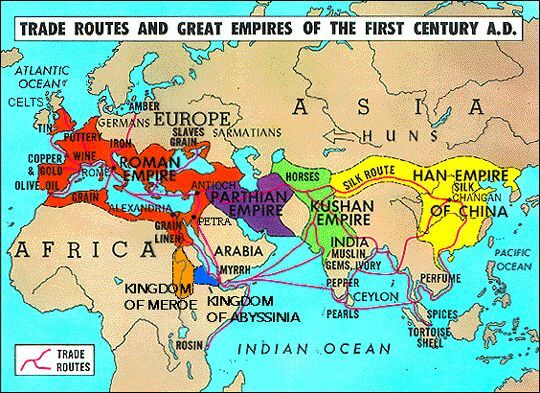 By the 11th century, you can see from the map just how far the trade routes had spread, although I think many would have been in existence long before this time, just perhaps unknown to us. Trade along the Silk Roads had periods of boom and bust, at some points in history trade almost ceased, while at other times it was booming. The fall of the Tang dynasty in China disrupted trade, while perhaps surprisingly the Mongol invasions and conquests revived it. Long known in the west as ‘The Hermit Kingdom’ Korea was for centuries anything but locked away from the outside world. Once a far looking place that was eager to trade with the outside world, using the Silk Roads to gain products, religions, and ideas, Korea inexorably turned in on itself in the 17th -20th centuries. Now, however, Korea is once more spreading its products and ideas onto the world stage. No longer known as the Silk Road international trade and travel to many of parts of the world are once again a part of Korean Life, and those long ago ancestors are probably smiling. You may also enjoy Korea’s Greatest Hero, Juryeonggu: A 14 sided Dice From The Golden Age Of Silla, and Horseback Archery In Korea: A Traditional Sport. ← JJCC The 1st Appearance In America: Review Of The Houston Show. Wow, even a history lesson. Great detail and post! Thank you. I’ve always enjoyed learning more about social history….still hate learning dates of things though.